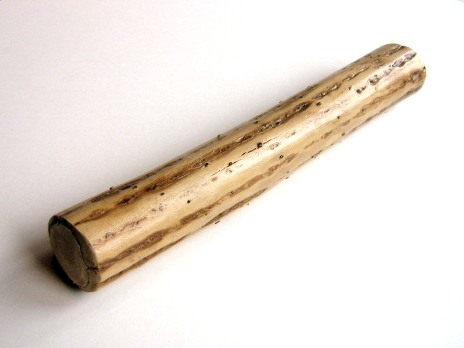 A Rainstick, is just one type of Shaker. A Shaker can be made of anything and equally filled with anything suitable. Young children in schools are encouraged to use them to accompany music, as you have probably discovered. Therefore, a shaker comprises a container, partially full of small loose objects such as beans, which create the percussive sounds as they collide with each other, the inside surface, or other fixed objects inside the container – as in a Rainstick, Caxixi or Egg shaker. So the term Shaker describes a large number of percussive musical instruments used for creating rhythm in music. As we mentioned earlier, today, schools seem to utilise any type of suitable container, with dried peas, seeds or small stones inside, to give everyone the opportunity to 'play' a musical instrument, and accompany the main musicians or singers! They are called shakers simply because the method of creating the sound involves shaking them — moving them back and forth in the air rather than striking them. Most may also be struck for a greater accent on certain beats. Shakers are often used in rock and other popular styles to provide the ride pattern along with or substituting for the ride cymbal. A Whistle is an instrument which produces sound from a stream of gas, most commonly air. It may be mouth-operated, or powered by air pressure, steam, or other means. Whistles vary in size from a small slide whistle or nose flute type to a large multi-piped church organ. Whistles have been around since early humans first carved out a gourd or branch and found they could make sound with it. In prehistoric Egypt, small shells were used as whistles. Many present day wind instruments are inheritors of these early whistles. With the rise of more mechanical power, other forms of whistles have been developed. One characteristic of a whistle is that it creates a pure, or nearly pure, tone. The conversion of flow energy to sound, comes from an interaction between a solid material and a fluid stream. The forces in some whistles are sufficient to set the solid material in motion. Classic examples are Aeolian tones that result in galloping power lines, or the Tacoma Narrows Bridge (the so-called "Galloping Gertie" of popular media). Other examples are circular disks set into vibration. Human whistling unaided by any instrument can be used for musical recreation or as a whistled language for communication over distances too great for articulate speech, among many other purposes. Musical instruments include the nose whistle or nose flute, the tin whistle and the slide whistle. Since a whistle produces a loud sound that carries over a great distance, whistles are useful for signalling. On ships, the boatswain's call is used to alert members of the crew. A dog whistle can be used to train a dog for hunting, herding, or other occupations. Industrial plants often use a steam whistle to signal shift changes or to give alarms of emergencies. Steam locomotives were equipped with train whistles for warning and signalling. A small-scaled steam whistle is found on a whistling kettle, to alert the user that the water is boiling. With the modern electric Kettle, these are now much rarer, but can still be heard on many campsites, and in homes where AGA cookers are installed. Storage tanks may be equipped with a whistle vent which sounds continually as the tank is being filled and when the tank level covers the vent pipe, the whistle stops indicating that the tank is full. They also occur as accidental by products of fluid flow such as supersonic jets, cavity resonances, whistling telephone wires, and idling circular saws. I’m finding it difficult to accept that a whistle is a percussion instrument. Can you please explain? I hope the following helps. There is a wide-ranging, inclusive list of percussion instruments. 1. Instruments classified by Hornbostel–Sachs as struck or friction idiophones, struck or friction membranophones or struck chordophones. Many instruments in this group, meet this definition but are often or traditionally excluded from the term percussion. 2. Instruments commonly used as unpitched and/or untuned percussion. 3. Instruments commonly part of the percussion section of a band or orchestra. These three groups overlap heavily, but inclusion in any one is sufficient for an instrument to be included in this list. However, when only a specific subtype of an instrument qualifies as a percussion instrument, only that subtype is included. For example, a samba whistle (or apito) is an unpitched percussion instrument, but a whistle in general is not. For obvious reasons a whistle is nearly always used by the percussion section of an orchestra. So it qualifies under heading 3 above. So, purely for interest's sake, I have included the whistle in this post about Percussion instruments. I have also referred to the fact that you have these available on your AR, and they are under the heading Percussive Voices! Just a couple of other percussion instruments to finish this subject off. A Dulcimer is a type of musical string instrument. It is a variety of Zither. 1 Hammered dulcimer, which is free-standing, and, most frequently, but not always, trapezoidal in shape, with many strings struck by handheld "hammers". This type of instrument is found in many cultures. Most countries have their own name for the instrument, for instance in Thailand it is called a Khim, in India it is called Santoor and many have different tuning systems. Being a struck string instrument, it is considered to be among the ancestors of the piano. a) Appalachian dulcimer, a folk instrument used in the Appalachian region of the U.S.
... ... I have also referred to the fact that you have these available on your AR, and they are under the heading Percussive Voices! You have and they are! Thanks for the explanation which, of course, I accept. It does feel strange that a blown instrument is classified as percussion but a whistle would not fit well in the woodwind section which would be the alternative. Strange world. But what about a tin whistle which can play several pitches? I don’t know where I would expect to find that - probably still percussion under Group 3. Wikipeadia has it right, and I would put in the woodwind section. I have one of these and even the most basic version Naples a wide variety of (recognisable) tunes to be played. Currently I'm "Over the sea to Skye", but have a WiFi connection today....so.....back to Percussion. 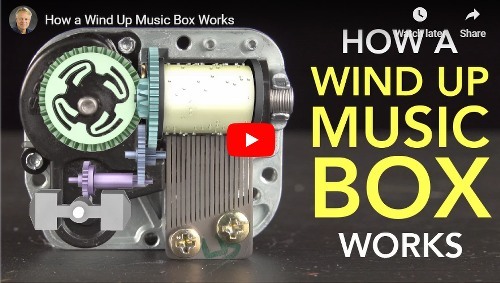 A Music Box or Musical Box is an automatic musical instrument, in a box that produces musical notes by using a set of pins placed on a revolving cylinder or disc to pluck the tuned teeth (or lamellae) of a steel comb. They were developed from musical snuff boxes of the 18th century and called Carillons à musique (French for "chimes of music"). Some of the more complex boxes also contain a tiny drum and/or bells in addition to the metal comb. The original snuff boxes were tiny containers which could fit into a gentleman's waistcoat pocket. The music boxes could have any size from that of a hat box to a large piece of furniture, but most were tabletop specimens. They were usually powered by clockwork and originally produced by artisan watchmakers. These were the portable cassette or CD players of the period, and the privilege of playing a music piece to others, or for your personal benefit made them very desirable and therefore, popular. For most of the 19th century, the bulk of music box production was concentrated in Switzerland, building upon a strong watchmaking tradition. The first music box factory was opened there in 1815 by Jérémie Recordon and Samuel Junod. There were also a few manufacturers in Bohemia and Germany. By the end of the 19th century, some of the European makers had opened factories in the United States. The cylinders were normally made of metal and powered by a spring. In some of the costlier models, the cylinders could be removed to change melodies, thanks to an invention by Paillard in 1862, which was perfected by Metert of Geneva in 1879. In some exceptional models, there were four springs, to provide continuous play for up to three hours. The very first boxes at the end of the 18th century made use of metal disks. The switch over to cylinders seems to have been completed after the Napoleonic wars. In the last decades of the 19th century, however, mass-produced models such as the Polyphon and others all made use of interchangeable metal disks instead of cylinders. Therefore, the cylinder-based machines rapidly became a minority. Here is an example of a fine piece of furniture, with a music box in it, standing on a matching piece that housed the interchangeable cylinders. The term "music box" is also applied to clockwork devices where a removable metal disk or cylinder was used only in a "programming" function without producing the sounds directly by means of pins and a comb. Instead, the cylinder (or disk) worked by actuating bellows and levers which fed and opened pneumatic valves which activated a modified wind instrument or plucked the chords on a modified string instrument. Some devices could do both at the same time and were often combinations of player pianos and music boxes, such as the Orchestrion. 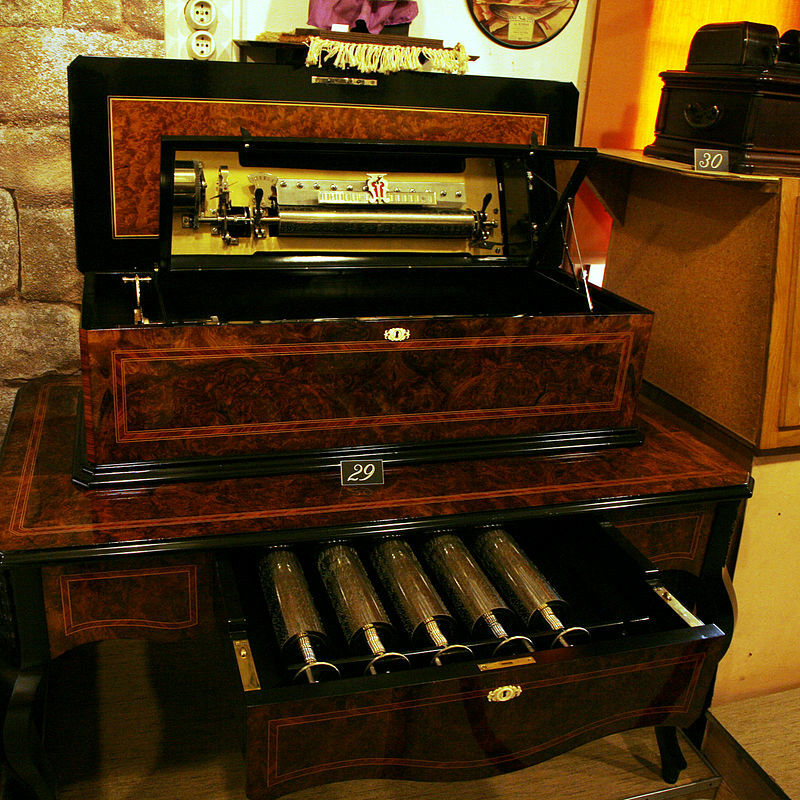 There were many variations of large music machines, usually built for the affluent of the pre-phonograph 19th century. 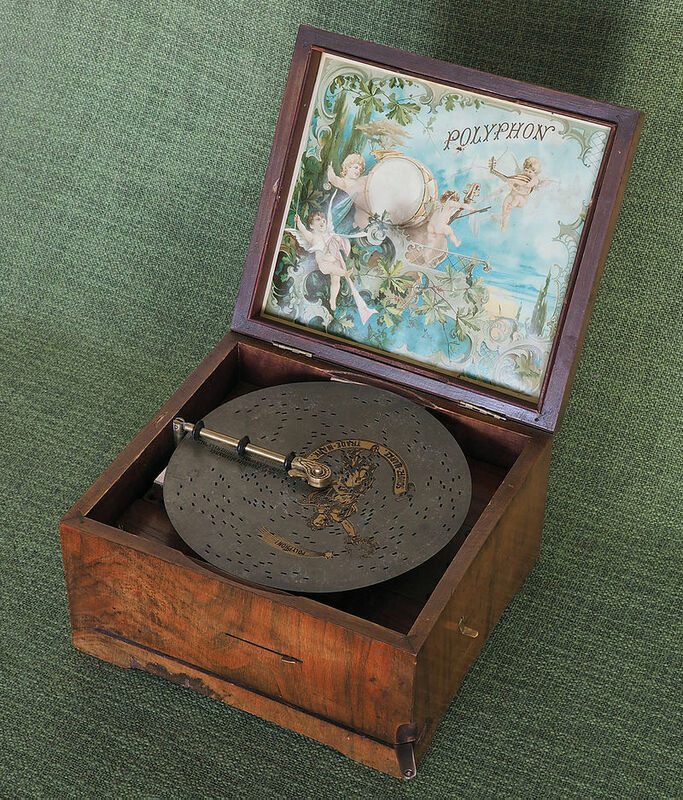 Some were called the Symphonium, others were called the Concert Regina Music Boxmachine. Both variations were as tall as a grandfather clock and both used interchangeable large disks to play different sets of tunes. Both were spring-wound and spring driven and both had a bell-like sound. The machines were often made in England, Italy, and the US, with additional disks made in Switzerland, Austria, and Prussia. Early juke-box pay versions of them existed in public places. Many Museums still have still-working versions of them on public display. At the end of the 19th century and the beginning of the 20th, most music boxes were gradually replaced by player pianos, which were louder and more versatile and melodious, when kept tuned, and by the smaller gramophones which had the advantage of playing back voices. Escalating labour costs increased the price and further reduced volume. Now modern automation is helping bring music box prices back down and they are produced either for novelty or for the luxury market. Collectors prize surviving music boxes from the 19th century and the early 20th century as well as new music boxes being made today in several countries. The cheap, small windup music box movements (including the cylinder and comb and the spring) to add a bit of music to mass-produced jewellery boxes and novelty items are now produced in countries with low labour costs. Many kinds of music box movements are available to the home craft person, locally or through online retailers. They may be very small and look insignificant, but when placed on a sounding board they can produce quite a high volume of sound. In the next Reply, there is a helpful YouTube video where Music Boxes are explained.